Want to learn more? 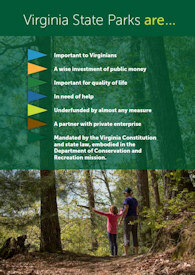 Download and read this 12-page booklet that vividly details the many positive impacts Virginia State Parks have on the state's economy. The booklet also covers ongoing funding and staffing problems. See what goes into operating a State Park in Virginia State Parks by the Numbers. Details on the economic impact of our parks can be found in this 2018 Virginia State Parks Economic Impact Study by Virginia Tech. Join us to help support Virginia's state parks. Associate membership is free. You may also become a sustaining individual member for $10 a year or a sustaining organization for $20 a year. Also, silver, gold and platinum memberships are available. Visit this page for a list of contributors at various levels of support. The VAFP is a registered charity for the Amazon Smile giving program and Kroger's Community Rewards Program. Learn more about Amazon Smile and register here. 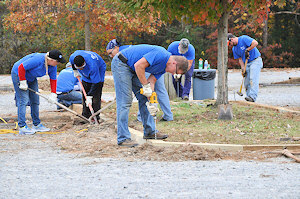 Select the Virginia Association for Parks as your charity here. Once you sign in, just login in to Amazon with this URL: http://smile.amazon.com/. Other than the special URL, everything else is like the regular Amazon.com site. Also, sign up for the Kroger Community Rewards Program. Every time you use your Kroger card, the VAFP gets a donation. Commonwealth of Virginia employee? Support Virginia Association for Parks in the Combined Virginia Campaign. Simply direct your contribution to the VAFP. Its CVC code is 03891. You'll find several articles on this page. More stories on VAFP projects, activities and issues of interest coming soon.